Metamorfosi welcomes you to Sithonia as the gateway to Greece’s garden paradise but don’t think that Metamorfosi is just the beginning. Olive oil is Greece’s most renowned export and each year Greek olive oil wins awards as a high quality product. Halkidiki is also a large olive growing region with about 5 million olive trees that cover a third of the area with almost 20 000 olive oil producers! Metamorfosi is the home to one of the largest producers of olive oil in Halkidiki. Each year from mid September to mid October the region practically shuts down as everybody heads to the olive groves. Olive harvesting becomes a family affair as everybody gets together to beat the trees and then collect the olives in nets that cover the ground. From here they deliver the olives to be pressed. The best quality oil is kept for themselves and the inferior quality is sold. When on vacation in Sithonia, just talk to your hotel owner, if they don’t have olive oil for sale, no doubt somebody close by does. The Metamorfosi coastline is home to several campsites that occupy some of the best beaches around Metamorfosi. The fragrant pine trees densely cover the region and there is hardly a better place to experience the blue and green that Sithonia is famous for. Relax on the beach under the shade of fragrant pine trees with an eye-catching view of the Aegean’s aquamarine water. Metamorfosi is also home to the only children’s summer camp in Halkidiki. The camp is equipped with everything imaginable to keep the children entertained, even an olympic sized swimming pool. This is a place where parents can leave their children and the staff will include them in daily activities including excursions in Halkidiki. Metamorfosi is a small village but still it has one of the highest concentrations of resort hotels in Sithonia. Just west of Metamorfosi you find a couple 4-star hotels that offer a higher standard of living than the average apartment does. They also organize and maintain part of the Metamorfosi beach that has been given ‘Blue Flag’ status. Just east of Metamorfosi are more resort hotels. One of the more notable is the Danai Beach Resort. This resort hotel has been rated as one of the most luxurious and service minded hotels in Europe. The Danai Beach Resort has become a favorite for those who can afford its hefty price tag, mainly tourists from the United Kingdom. Despite the cost of the Danai, nobody can find a case to give it a bad review. Metamorfosi is a laid back village with not a lot of extras so nature is what tourists come here to enjoy. Let us give you some tips on how you can spend your days. The Metamorfosi beach stretches along the coastline for several kilometers and this is where most tourists coming to Metamorfosi spend their vacation, sun-tanning and swimming in the perfectly clear and shallow waters. The beach offers a mixed bag, there are sandy parts that are mainly organized by hotels and are recognized as ‘Blue Flag’ beaches with beach bars and sun beds. Then you have other parts of the beach that are more pebble mixed with stone and no organization. In between you may even find a lonely sandy cove all to yourself. Explore the lengthy Metamorfosi beach and get a rest under the pine trees that are plentiful and fill the air with its refreshing aroma. With the sun warming you up and the sound of the gentle waves on the shore, the combination is bound to put you right to sleep – Metamorfosi is definitely natures best spa center! What can get you moving in Metamorfosi for that extra spice in your day? Well, we have to admit that there is not a lot in Metamorfosi for active vacationers. If you are living at one of the many resort hotels then you just may have the best opportunity for animation. The hotels have swimming pools with pool bars and most have sports facilities like tennis or volleyball. They also offer water-sport activities such as windsurfing, canoeing and snorkeling. Taking long walks along the Metamorfosi beach can also be an enjoyable way to get some movement into your routine. In the village of Metamorfosi the central small park has a popular bar that is open all day and attracts more visitors in the evening, then there are a few tavernas in the center where you can enjoy traditional Greek cuisine. Close by Metamorfosi there are many things to do. The ruins of ancient Olynthos are not so far and of interest for those who like history. Petralona Cave is just a bit further than Olynthos. Heading east down the peninsula, Nikiti is just a 10 minute drive away and here you have shopping and some great restaurants. 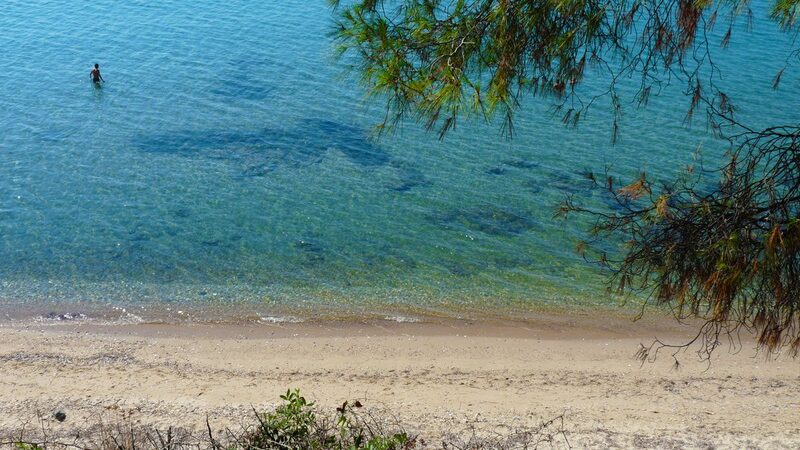 The Nikiti area also has some of Halkidiki’s best beaches. Ormos Panagias is just 20 minutes drive and from here you can do the Mount Athos cruise. If you are in the mood for some hiking, head north to the Holomontas mountains of Central Halkidiki where there is a nature reserve called Taxiarchis. This is also a great winter destination.